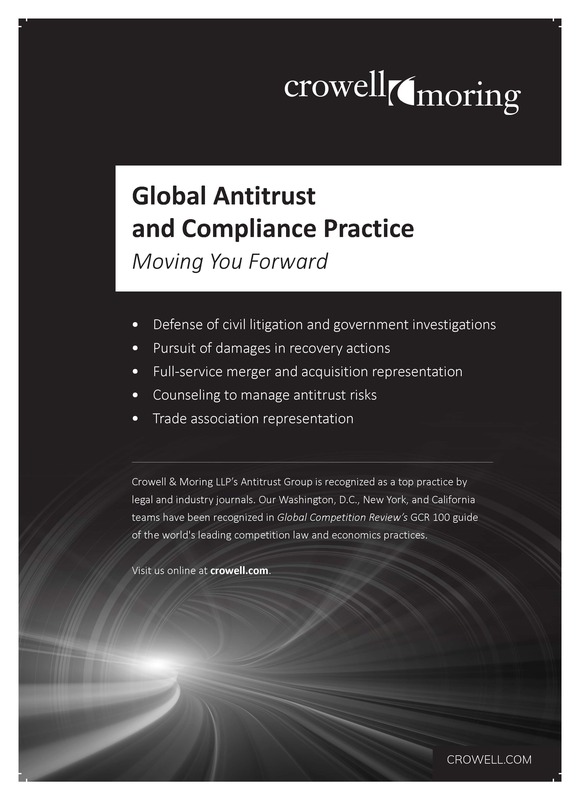 Crowell & Moring is seen to have a high-quality antitrust practice in California, with a specialisation in representing opt-out plaintiffs, such as General Motors and Lenovo, whose follow-on damages claims – against the roll-on roll-off vehicle shipping and battery cartels, respectively – are big enough to be worth bringing outside a class action. Former Gibson Dunn associate and Jones Day partner Jason Murray, who also co-chairs the global competition practice, leads a large team across three California offices. As head of strategic growth in the state for the whole firm, he says he is well positioned to boost the size of his team even further. The firm’s California offices do plenty of defence-side work, including representing Koa Speer in the resistors follow-on actions. Jordan Ludwig and Murray secured the throwing out of a monopolisation lawsuit against Kaiser Permanente subsidiaries, brought on behalf of NorthBay Healthcare Group by Latham & Watkins, in August 2018. Third-party representations include Dan Sasse advising Synnex in the Qualcomm consumer antitrust litigation. Perhaps Crowell’s highest-profile case, at least among antitrust insiders, was the defence of Ericsson against claims that its patent licensing practices were anticompetitive. John Gibson and Samrah Mahmoud in Irvine and Robert McNary in Los Angeles acted for the smartphone patent owner. CROWELL & MORING’s antitrust practice provides merger, investigations and civil litigation services. Olivier Antoine leads the team, which added former deputy assistant attorney general Juan Arteaga in July 2017. The firm’s work remained at a high level in the past year, as it served as co-lead counsel for longtime client AT&T in its merger with Time Warner. Crowell has also been been United Technologies’ lead antitrust counsel in its $30 billion acquisition of Rockwell Collins, the largest aviation merger ever. AT&T, Siemens and Da Vita all retained the firm’s services on other deals, government investigations and potential litigation. On the civil non-merger side, the New York team represents a New England college as the DOJ investigates into whether certain colleges and universities colluded when making early decision admission determinations and setting their early decision policies and practices. The team also has been involved in most of the major DOJ probes in recent years. The firm counsels a generic drug maker in connection with parallel investigations being conducted by the DOJ, Congress, and several state attorneys general regarding a potential price-fixing and market allocation scheme. It also advises an international shipping company and its senior executives in the DOJ’s investigation of the container shipping industry; and continues to represent senior executives in global cartel investigations into the auto parts, canned tuna and financial services industries. Crowell & Moring also has several confidential mergers and investigations on its plate. CROWELL & MORING has “a number of good people”, the co-chair of a top DC practice says, while another rival admires the firm’s client list. Antitrust co-chairs Shari Lahlou and Jason Murray were joined in September 2018 by Alexis Gilman, previously the assistant director of the mergers IV division in the Bureau of Competition at the FTC. The firm has expanded and diversified while retaining long-standing customers such as AT&T, whose partners Wm Randolph Smith, Jeane Thomas and Shawn Johnson guided through its $85 billion acquisition of Time Warner. Kent Gardiner, Lahlou, David Schnorrenberg and Joseph Miller acted for Humana in its proposed $37 billion sale to rival health insurer Aetna, but the companies opted to drop their deal after the DOJ persuaded a Washington, DC federal court to block it. The firm currently represents United Technologies in its $30 billion acquisition of Rockwell Collins, the largest transaction in aviation history.